Ronke Fashola is Course Director for BA (Hons) Fashion Promotion with Marketing. Ronke has spent over 10 years working within the fashion industry, starting her career within fashion buying and product development. She went on to set up one of the leading style consultancies in the UK. With her business acumen and industry knowledge, she crafted a successful International Business pathway at the London College of Fashion. Her expertise enables Ronke to be capable of teaching over 6 disciplines within the fashion industry. Ronke’s professional affiliations span not only within the fashion industry, but beyond. She has worked with a number of industry experts throughout her profession. This has enabled her to gain a foothold into areas such as technology, sustainability and beauty industry. 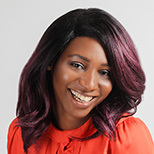 As a professional practitioner, Ronke strongly believes in the inclusion of entrepreneurial skills, which are directly transferred into her teaching as a fashion business owner. This ensures the students have real time experience throughout every step of the course.